Gloom and despair may come to mind when the color gray is uttered. The white and black combination may be associated with cloudy days, but if you look closely, you'll most likely find the shade in many sophisticated rooms in hotels, restaurants and other chic establishments. So why is the color taking center stage in contemporary settings? Just like its mom and dad, gray is a neutral hue. This means that it's a great canvas for different design aesthetics, so you need to stop associating the color with sadness! In a small space like the bathroom, gray can be the perfect balance between a sterile-looking white and a black that can quickly turn the space into a cave. If you're not sold on the idea of having gray as the focal color in your bathroom, use it as the canvas for other colors to pop out instead. With a gray wall, mix it up with subdued yellows and blues for your bathroom accessories. 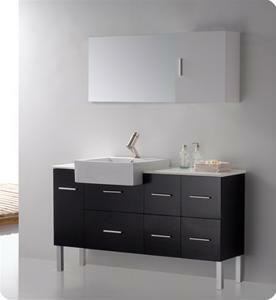 The room will even look more sophisticated with chrome or stainless steel faucets and other fixtures.